SKU GB-HORNS does not exist. This book collects a wide range of perspectives on the theme of music in the mood of the fifth, in order to help teachers and caregivers understand and work with this important means of supporting the healthy development of the young child. Classic articles by Jennifer Aulie, Wilma Ellersiek, and Rita Jacobs are included, along with new contributions by Michael Deason-Barrow, Jana Hawley, Renate Long-Breipohl, Sally Schweizer, Estelle Bryer, Eleanor Winship, Jill Taplin, and many others. After many years of experimenting with the mood of the fifth, I am so glad to be able to offer this collection of articles by our colleagues in the Waldorf movement. Many teachers find the journey into mood-of-the-fifth music a bit daunting; and many may share my resistance to making such a journey just because "we are supposed to." The authors in our collection present a wide variety of approaches to this topic, sharing their own experiences and research into the "what, why, and how" of mood-of-the-fifth music. Created by a Waldorf educator for the children in her care, these delightful new songs and singing games will bring joy to every home and classroom. Dance around the Maypole -- play clapping and counting games -- celebrate a lost tooth -- sing prayers and lullabies -- all with the harmonious, healing music of the mood of the fifth. Delightful for children and the adults who lead them. Push and pat, push and pat! So many people have asked for more songs in the mood of the fifth* to share with young children. It is a joy to be able to announce this beautiful little book that is just what parents and teachers have been wanting - a beautiful way to carry children through the day and introduce them to the world where we do things to make life better for all. Just browsing through these songs is inspiring and joyous. Please do share these songs with all the young ones in your care - they speak of a love of the earth at every turn. *"The Mood of the Fifth" describes a type of pentatonic music, usually centered around A above middle C, which is light and delicate sounding, just right for very young children. This edition replaces the saddle-stitched version of A Day Full of Song. 64 pages, 8 1/2" x 7". 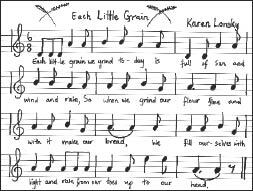 Learn the songs from the teacher who wrote them - a beautiful accompaniment to Karen Longsky's songbook, A Day Full of Song. All 42 songs from the book, in vocal and instrumental versions to aid to learning the songs at home. Quintenlieder has been for many years a treasured resource for all who want to share the joy of music with young children. Julius Knierim has gathered children's rhymes from throughout Europe and, by way of showing us all how to do it, set them to lilting and lovely songs written in the mood of the fifth. He has also taken the time to explain to those of us not well-educated musically just what makes a pentatonic song one that is "in the mood of the fifth" ("Old Man River", for instance, is written in a pentatonic scale, but is hardly in the mood of the fifth). Further, he shows graphically how to keep the notes of a song you create in the mood of the fifth - I am not at all a musician, yet found myself easily inventing song-like melodies that floated through the air. It was fun, too! If children ages 9 and under are in your life or your classroom, you'll want to use this book. There are wonderful things to be learned and beautiful songs to sing! Drawing from her many years’ experience as a class teacher, as well as a teacher and lover of music, Cynthia Frongillo takes us on a journey through the music curriculum showing how it is begun and developed through the grades in a Waldorf school. She gives examples from her own experience and outlines both singing and instrumental training. This is a lovely, specific guide to teaching music within the context of Waldorf Education. I think anyone who has had questions about how to approach music in this way will thoroughly enjoy this book - and find it a great resource. Michael Preston has brought together a rich and varied presentation of some of the best songs and hymns from around the world. There isn't a single entry that isn't engaging and melodic, and arranged in a wonderful way so that the different voices really interact and support each other. This is a collection any recorder player would love and every recorder ensemble will rejoice to work with, the results are so very beautiful. This is a gift to the world of music, as much as to the world of Waldorf Education. This research paper describes the Austin Waldorf High School's world music program for each of the four grades. It offers a very valuable discussion of the method for each lesson and then shares the data from a questionnaire that was circulated, hoping to discover whether the course had changed the way students related to music in a wide range of categories. Also included are valuable appendices on the various world musical traditions and a discographic resource list for each grade level. The life and work of this Swedish artist is not so much the introduction of a new method... rather, this is the first adequate description in all music history of the western art of singing in terms of the human being’s true nature. And this could only come about once a spiritual scientific view of the human being had developed, enabling us to grasp singing processes that extend far beyond purely physical laws. This book is pure gold for the singer and singing therapist of today. Through experiential exercises and careful reasoning, Uncovering the Voice provides a new, spiritually enlivened interpretation of the processes involved in singing. It develops knowledge of the essential nature of song, and summons us to work for the purity and preservation of true singing. First published in Germany in 1938, Uncovering the Voice disappeared under the weight of political events and the Second World War and was not republished until the 1970s. The new English edition of this classic work includes a biographical account of the author by Jürgen Schriefer, as well as previously unpublished photographs. Valborg Werbeck-Svärdström was an accomplished and talented opera singer. Rather than following the singing traditions of her time, however, she sought to work from a new perspective that allowed for a profound spiritual understanding of the human voice. In 1924, Rudolf Steiner, with whom she had collaborated for over twelve years, encouraged her to represent the Schule der Stimmenthullung (School for Uncovering the Voice), the first anthroposophical singing school. This was a pioneering task, and she carried it out energetically and faithfully until her death in 1972 at the age of 92. This is an exploration of the cosmic origins of human beings and the evolutionary laws that govern their development. Husemann applies musical principles as a method of gaining insight into the structure of the human body and the forces that work on it, seeking to use our experience of music to explain the physiological and anatomical relationships in the body and the spiritual influences that determine physical development.